This thread was archived on 7 December 2016 by Cqm. As Shauny revealed in the patch notes teaser today, we're soon getting an in-game title - [Name] the Wikian. The main thing this thread wants to determine is who we want to give it to - or rather how we decide who. Minimal - 10 edits as a token contribution? Casual editors with 100s of edits? Dedicated editors with 1000s of edits? Very dedicated editors with 10s of 1000s of edits? I also have a list of names I can propose upfront - there's a lot, so I won't put it here unless it is really wanted. The title is given out by a specific user (surprise! Its me) using a special item (a book I think) which is only obtainable via a Jagex mod adding it to your account manually. You click the book, enter the user's name into the prompt, confirm the name you typed in (a yes/no prompt), and they get the title (they don't need to accept anything). The recipient has to be online at the time. Shauny last told me that the expected release date was the update of 5 December. So first of all I believe there was a title planned from a meeting a while ago when you had a talk with Jagex, but this was something I feel so honoured to do for you wonderful people. “ I deserve the title. I have >160,000 (the second most of any human account) and still log on n game every once in a while. I revolutionized countless templates and spearheaded the switch from wikicode to Lua. Even after my ban-turned-voluntary-exit, I continue to provide advice and help that improves the wiki. While not the most popular or liked, I am still without a question, one of the most prolific editors, both by subjective opinion of my peers and by objective measure of my contributions. I only communicate with my small circle of friends when I am actually online. So tainting the reputation of the wiki and its community is not a real worry. Let's not forget that I was indeed the original proposer of this idea, albeit in jest. I am no stranger to Shauny either, who has gone ahead and decided to make this a thing. I may have all but quit, but I would love to accept this post"humous" accolade. Comment - Titles should hold a certain amount of prestige. Titles that hold no prestige are never used because they're common/not cool/etc. Although editing a wiki shouldn't be seen as an achievement or anything like that, I feel like opening the floodgates for every noob to have a wiki title will just devalue this kind gesture. Not to mention that it has to be put on an account manually each time. There should be some sort of threshold. UoTM seems like a good idea. I don't think there'd be an issue with attendance on it. If someone applied that clearly wouldn't "deserve" it, the masses would speak out. Also, common sense would apply in any case. Plus, what would we do if the user name we use on Wikia isn't the username we use most often in RS? I think that if we have edit requirements, they should be ignorable in some cases. Users that do big things with a few edits, or provide a lot of extra stuff via chat/etc without directly editing, and so on. Comment- Agree with Fswe. Or, what if we do some monthly/bi-monthly competition which involves people doing as many constructive edits as they can in a week (let's say), and if you do 350 edits in the week (50*7), you get the title. A minimum edit requirement of 500 non-userspace edits or file uploads. This shall include talk page edits, as it signifies an involvement in the community. As with the vast majority of processes on the wiki, this can be overlooked if there is a compelling case, such as a member of the events team or clan chat admin who does not have a notable presence on the wiki. A UOTM-style process will be used to assess the quality of the user. If someone has consistently added nonsense, got into edit wars or uploaded images that are generally speedy deleted, then they should be filtered out at this point. There shall be no quota on how many users can possess the title, and thus there shall be no quota on how many successful nominations can be made per month, unlike UOTM. I assume this is obvious, but I'm including it for clarity. A user is disqualified from nominations if they are blocked on the wiki. This applies if the user is currently blocked, or is blocked during the process. I considered global blocks, but realistically they are difficult to police, and the details are never shared with anyone not employed by Wikia. While it may be obvious in some cases, I don't think we should start a precedent in this direction. If a user becomes infinitely blocked on the wiki or the equivalent in the cc or other chat media, then the title shall be stripped from their accounts. I would guess the vast majority of established user blocks are for UTP infractions and users in this situation are evidently not representative of the wiki's values and thus should not represent the wiki in-game. I do not imagine this would be a common point to enforce, but no doubt it has happened in the past and will again in the future. Self-nominations shall be automatically void. If someone is genuinely worthy of the title, it will no doubt come in due time. As with RfA, RfCCA, UOTM, etc. the nominated user should accept or reject the nomination as they see fit. This implicitly requires the person to have an active account on the wiki. There shall be no quota on how many in-game accounts tied to a particular user may have the title. As with many other wiki-related roles, the trust, or in this case award, is tied to a person. If that person chooses to play the game with 20+ accounts, I see almost no reason to place any limitation on that. The only exception I can consider is account trading. If people feel this is a problem, I would propose an in-game total level requirement of something easily obtainable such as 200 to alleviate those fears. All users with accounts older than 2 weeks shall be able to vote for the nominations, as well as nominate any user. 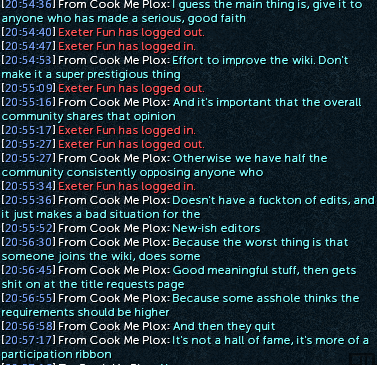 In the interests of fostering a community, I don't think adding arbitrary edit requirements is necessary as it may exclude those in the clan chat from voting. However, this restriction should still prevent any sock-puppeting. As with UOTM, the nomination shall include a paragraph explaining why the nominator feel someone deserves the title. Unlike UOTM, both supports and opposes (with an optional reason) are valid voting options. This is a filler proposition because "10 commandments of the Wikian" sounds better than 9. Support I think at least 100 edit (and be active) should be a req for eligibility for even requesting the title. I self-nominated for both my RfA and RfB. I'd like to think I turned out half decent. However, this isn't RfA, or any other request for rights on the wiki, so I disagree with your premise. Reduction/removal of the number of edits requirement (100-200 at the most, I think), with a heavier emphasis that the requirement is a guideline/suggestion and is ignorable. I tend to agree with Cook that we shouldn't be exclusionary about this. We need to get new editors and this is a great way to encourage it. I can't guarantee being able to remove it from anyone on demand. Treat removal as 'emergency' only. I can go either way on restricting self noms. stuff - I think the part about having >200 total level does mostly cover my concern about having the title on too many accounts (which would also simply spam the mods dealing with this). However, I would make that a requirement for any second title requests. If someone has a very low total level, or simply does not play on their high-level account anymore, they should be able to have their actively-used primary account with <200 total get the title. Of course this would make it possible to get the title on 1 dummy account and then get it on your main, but it still prevents excessive dummy accounts from having the title. I know, this is an uncommon situation, but it might be useful to mention. Now, regarding the concerns about self-nominating, I think it'd be useful to add an extra point that would cover previously active users who did make a contribution. I'd say that anyone should be able to get the title who meets the rest of the requirements (such as not being banned etc.) AND either been UOTM, has (Admin|Full-bot|Chat mod)+ user rights or is elligible for a Clan Chat rank (incl. ET). In those places the user would have already passed a discussion (or vote in the case of UOTM), so I'd say it's unnecessary to require another vote about the same user. And no, of course you wouldn't have to go digging in the archives to find what everyone's username was; simply give them the title when they ask for it. For the rest of the users, I think a strict requirement would be unnecessary, as some others have pointed out, since the discussion or vote will already consider points such as editcount automatically. While keeping the title a bit more exclusive than "Has edited that one time", I definitely do agree with Cook that people should not be judged too harshly. A title is not something that gives people any extra rights (except for bragging rights of course), so it should just be treated as a token of gratitude, basically. Editors who have made some significant positive contributions to the wiki (I do think having some kind of suggested edit count would be helpful for people making nominations, but our guidelines should make it clear that the number is a guideline and not a hard requirement and that we are looking for quality editing rather than a particular number of contributions). People who are trustworthy enough to represent us in game (i.e. not people who are blocked/disruptive/breaking UTP etc). Aside from this I think we should decide whether we want the title to be about being involved with the wiki in general or about being involved in editing. Personally I would like to see the title reserved as something signifying that a player has knowledge of editing, as I mentioned above. Therefore I don't think people should be given the title automatically because they are ranked/active in the clan or on the events team: currently the processes for these kind of positions do not require candidates to be editors of the wiki. I also don't think having passed a UoTM in the past should guarantee being awarded the title: as others have pointed out there's been issues with at least one of the previous UoTM winners and apart from that many have gone inactive. Anyone that was UoTM in the past and is still active should easily pass the title request now. I do think we could make it so admins can receive the title as part of their request for admin in future (as with how people can request clan rank in a RFA now if they feel they would use it). Current admins could also get given the title without having to make a formal title request (since RFA already assesses the things I think we are looking for in giving out the title) - would help cut down the number of initial requests for titles. Can we at least ask Shauny about having the ability to remove the title in case of a disaster/emergency later down the line? Shauny said that he would be maintaining some kindof list of who has the title unlocked. Could we get access to that to keep a record of who has the title? Or make a list ourselves? Comment - This entire thing is sounding more complex than it needs to be. No nominations, just a simple check for the number of edits performed and if they have caused harm or benefited the content on this site. If people really want to alter articles in a manner that is not helpful and just to get to a specific threshold for the final tally to obtain the title, then they shall be ignored. Support/comments - I also think the title shouldn't be handed out willy-nilly, however not too hard to obtain. UoTM-type process is probably thus the best way to decide who gets the title. Also, as per Isobel, I think current admins should get the title automatically without having to make a formal request. - We can do title removals but I'd much rather not, like ever. And if it ever becomes a common thing then I'd have a personal problem with it. I raised the point of the title after consulting with others who agreed with the points raised by myself. Supportish - I support the small discussion, which would allow us to grant the title to those who contribute in a significant way other than simply editing. However, I think file uploads should count towards the edit count guideline. I also think we can cross out #7, and leave that mostly up to the user holding the Wikian book, but generally be okay with users who use multiple accounts having access to the title on multiple accounts. Remove the portion on removing the title from accounts, as titles will not be removed from accounts as that is unnecessary strain on Mod Shauny bae. 1. The person doesn't bring bad reputation for RSW. or the persons contributions outweighs the bad reputation s/he may cause (or has caused). Controversial decisions should be left for admins behind the scenes, everyone knows (or at least should) that we're in good hands, they know what to do, in case if they don't know what to do (aka no admin knows the person) it should be handled in public (YG). 2. The person has contributed to the wiki. Assuming that people come to RSW just for the title: People see the title: A) They want it. B) They don't. -> A) They start doing edits. (Remember, all newcomers aren't the best at it) B) They start doing trash edits, clearly just for the title. C) They don't start editing. -> Some quit after receiving the title, some may continue editing. If we'd have a high edit requirement, it would discourage people to cheat (with unnecessary/spammy edits) and/or give up. Low edit requirement would mean they'd have to get some experience in editing, and the threshold is not too far so they would not give up, and in the end they might like editing, they might stick around. I'd suggest an account that is older than one month, you can "cheat" the amount of edits, but you can't cheat time. (Old account get a free pass on this one, this is just to prevent people from joining and spamming just for the title) If you're a new editor you might as well take your time and do some edits while waiting. The amount of edits could be looked into case by case, minor/huge/good edits matter more. Title is not given to your alts, this could lead to account selling (with the title), and trashing wikia name. Why would you have wikian title on your account that is 1/10th of the age of your wiki career? Get it on your main, nevertheless if you play with it. Use common sense, I have nothing against giving it to alts but people can make a shitstorm about it, I suggest that our admins can have the title on their alt, but in the end I don't care. Self-nominating, if you consider yourself a wikian, aka wikia contributor, and you don't trip over on req/guideline 1 and 2, you should have this title. If no one knows you even exist, you're a fucked lonely soul. Yes you should be able to self nominate. "I'm gonna allow an admin of RSW to go out and give out the wikian title to people who are essentially involved with the wiki"
"I'd say if they're registered and ask. They can get it. IMO"
So, at first I thought a lot of people should be getting this title, as per Shaunys words ("I'd say if they're registered (at the wiki) and ask (for the title). They can get it. IMO"). But seeing how people like to think that this should be high-requirement title, and seeing how the title is presented in the patch notes, I'm gonna change my suggestion a bit. "The title will be given to players that the Wiki have decided are valuable contributors to it"
"Valuable contributors to the RuneScape Wiki fan site may be awarded the 'Wikian' title." 1. The person doesn't bring bad reputation for RSW. or the persons contributions outweighs the bad reputation s/he may cause (or has caused). 2. The person has contributed to the wiki in such a way that could s/he could be considered valuable for the wiki. Either with high edit count with a lot of minor edits, low edit count with major edits, helping with any wiki related stuff off-line, in-game or in other media. 3. Admins should decide if the person is worthy of the title. Question - A long way up, Degen mentioned the idea of those active in the in-game community being eligible for it. My question then is, what about those who are active in-game, in-clan, but don't have many edits? For example, User:JL5270 is RSN "Juan Luis", and if you're in the clan at least somewhat often, you know who he is. He's a clan admin with avatar rights but at the time of writing this, he has 19 edits. If the thoughts on requirements is leaning more toward actual on-site activity, then someone like him would be excluded from the title. Given how long he's been in the clan, how much XP he has gained for he clan, and his general reputation, I'd argue that a person known in the community in this way should be eligible. There should be some thinking on how it'll be distributed to clan members according to rank. Not sure if I missed anything while reading the above discussion, but this is definitely an important factor that's being overshadowed by the talk of minimum edit quantity/quality. On another note, what about users who are active on-site but are not in the clan? I'm assuming there would be more resounding support in this case rather than the one I previously mentioned, but it's something else I don't think has been mentioned or discussed much. An example of someone who'd fall into this category would be User:Jlun2, currently RSN "Get The Bond" with over 36k edits and permanently guests in the clan. "As for non-English RSWs, I do intend to support them with the title. I didn't mention it on the thread because it is already gigantic with just our stuff. Once the thread is closed, you should just use the normal process (or let me know and I can nominate you). You may want to set up your own process, that's up to you - there's obviously a level of difficulty introduced due to the language barrier for the English community to look over your edits properly." "Included in this is the OSRS Wiki, RSC Wiki, and other sister wikis (see RuneScape:Links#Sister_wikis) (should the users also play RS3). I shall consider other wikis not mentioned on the page, like the Chronicle Wiki on Gamepedia. (Side note: it would've been nice if the guy claiming to be an admin on a bunch of RS-related wikis didn't rant on the patch notes thread, and instead came to talk to us like you [the pt-br wiki admin] did.)" A user has requested closure for The Wikian. Request complete. The reason given was: Since everyone is supporting it. How to accommodate sister and inter-language wikis in requests. Whether to grandfather in groups of users. This page was last modified on 13 June 2018, at 13:52.